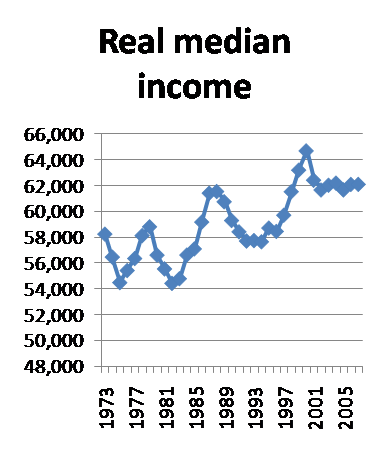 Via Paul Krugman at the New York Times, a visual that shows real income history for the 35-44 crowd: But you'll be glad to know that those over 65 have seen a huge jump in their income under the current administration, in contrast. For many, the housing rush was one of the only ways the younger crowd (read: still working) could better their financial fortunes during the past 5 or so years, even if they were busy leveraging themselves to untenable levels to make it happen. With housing now a complete bust, and the correction cycle in its infant stages, the ugly truth on real income is much more hard to ignore. I've said that housing and mortgages will be central to the upcoming election, and this is why.